It is a well renowned saying that he was born with a golden spoon in his mouth, that means that some one has been very lucky because he was born to a rich and elite family. But here in today’s article we are going to do something magical with pretty ordinary plastic spoons. We are going to recycle the plastic spoons into lighting lamps. Well, who on planet earth doesn’t know about the plastic spoons, all of us are familiar with them. But subsequently none of you would have ever witnesses such a lamp made using the plastic spoons for sure. 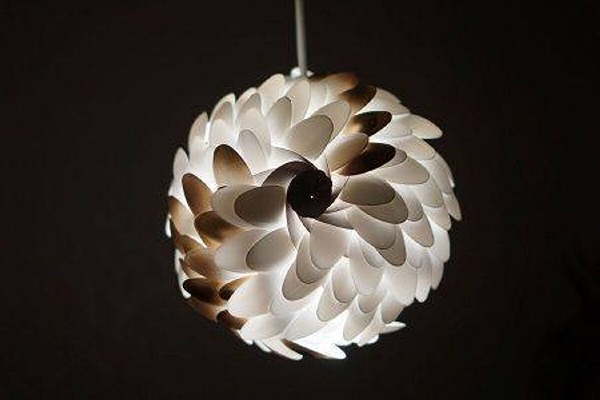 Just to deal with your curiosity here we have given the entire project of recycling the plastic spoons into a stylish lighting lamp. Up till now you guys would have seen conventional glass globes, but this one is simply different from all of them. A huge water cane or bottle is used as the base, and the plastic spoon heads without their sticks are pasted on the bottle with a specific sequence. 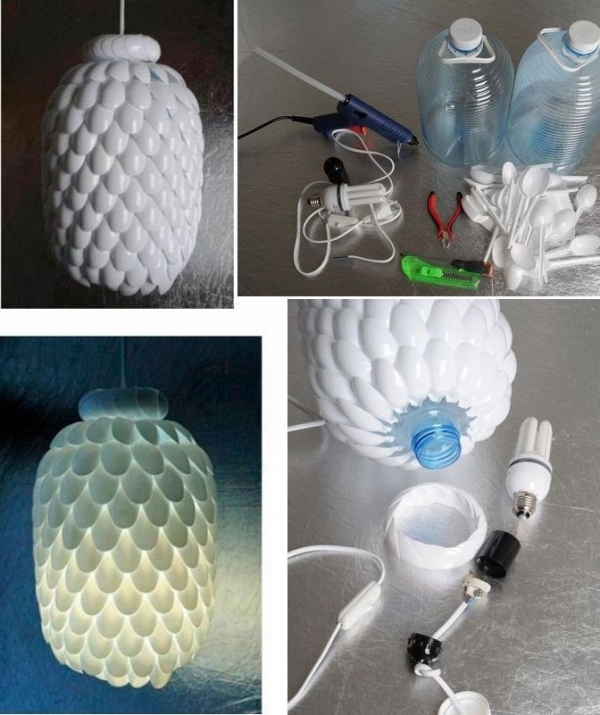 The electric wire and Edison bulb is crossed from inside the mouth of plastic bottle, since we ended up making a recycled lamp with plastic spoons. Since we are done with a major project where we have analyzed the detailed procedure of recycling a lamp with spoons. 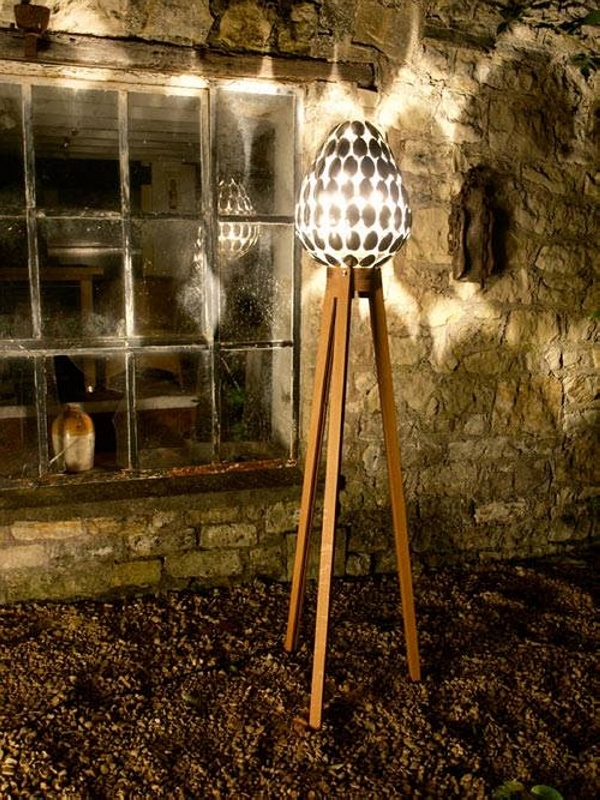 Here is another lamp made with the same material. Though it is a bit tricky shape wise, but could easily be figured out by a crafter who is smart enough. 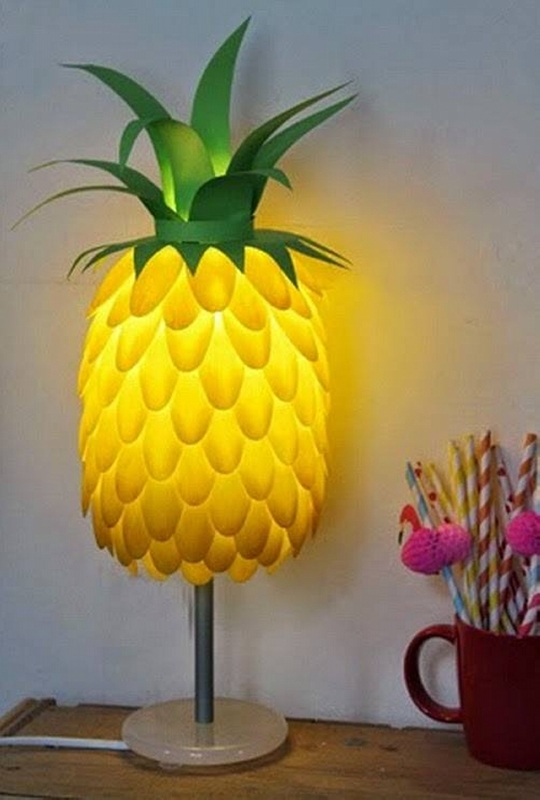 Just look at this lamp on stand. The reclaimed stand is made with metallic rods, and the lamp on the top holding a spherical shape is again made by recycling the plastic spoons. You can get these spoons easily from the market, they are always pretty cheap cost wise so not to worry about the cost.